Guess MTN is gradually looking for a bailout from recession battling the Nigerian economy at the detriment of the consumers. Last month MTN adjusted its data plan which it dubbed Revamped Data Plan. Now, MTN subscribers on the Pulse tariff plan are charged 22 kobo per seconds, effective July 28, 2017. This means they will enjoy call at Flat rate of 11kobo/sec ACROSS ALL local Networks after spending NG₦11 daily. 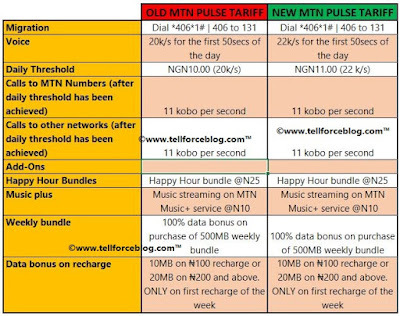 See table above for breakdown of the OLD and NEW MTN Pulse tariff.